Last week we looked at compartmentation within this apartment complex. While carrying out my initial survey of each apartment the very first thing that came to my attention was the entrance door to the apartment. When I knocked on the apartment door the tenant had great difficulty in opening the door. The first tenant could not find the keys and when the keys were found the lock’s proved difficult to open, then the security chain had to be removed. If this was an emergency situation it would have been even more difficult. Current standards do not allow keys to be used on the inside of an escape door, instead you must have thumb turn locks and no security chain. While I appreciate that people will see the need for security and that is why there are so many locks and chains on an entrance door, they must also look at their safety in the event of an emergency situation. For these two bedroom apartments fire doors were not required within the apartment due to the short travel distance from each room to the front entrance door of the apartment. On the other hand the three bedroomed apartments did require fire doors within the apartment. The three bedroomed apartments have a very large entrance hallway so fire door sets were required, including self-closures and fire seals on each door. The protected stairway enclosure and the lobby leading from each apartment also require fire door sets. The existing door sets needed upgrading to enable them to comply with the fire safety certificate. The fire seals had to be replaced with smoke and intumescent seals. The doors and door frames had to be adjusted to enable them to close and seal properly. Locks on these type of fire doors are not allowed. On any fire door frame you must not paint over the fire seals as this will prevent them from operating properly when heated. On each escape route the walls must be capable of achieving a class 1 rating. This means that the wall or wall covering must not be capable of catching fire. If you need to contact me for advice feel free to do so. 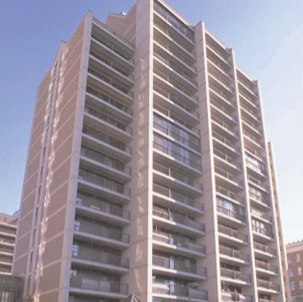 The protected stairway enclosure and the lobby leading from each apartment also require fire door sets. The existing door sets needed upgrading to enable them to comply with the Fire Safety Certificate certificate. The fire seals had to be replaced with smoke and intumescent seals. The doors and door frames had to be adjusted to enable them to close and seal properly. Locks on these type of fire doors are not allowed. On any fire door frame you must not paint over the fire seals as this will prevent them from operating properly when heated. On each escape route the walls must be capable of achieving a class 1 rating. This means that the wall or wall covering must not be capable of catching fire. Starting with the apartment door, this must be a fire door set, which includes the door, frame and ironmongery, the condition of the door itself is very important. It must be free from damage and capable of opening and closing quiet freely. The door must have a self-closure unit fitted and adjusted properly. The door frame must have an intumescent and smoke seal fitted within the grove that has been cut out for it. You must not paint over the seal or hold it in place with pins. The door must be fitted evenly within the frame, a gap of approximately 3mm is recommended. The reason for having a fire door as an entrance door to the apartment is, in the event of a fire breaking out within the apartment the fire needs to be contained within the apartment for a given period of time. This will prevent the stairway becoming unusable or smoke logged. Within the apartment there are waste pipes and ventilation pipes penetrating the apartment wall, ceiling and floor. These pipes must have fire collars fitted and sealed around all openings where services pass through. The reason for this is to prevent smoke or fire passing through the openings to another area. Each ceiling must have a fire rating of either sixty minutes fire resistance or thirty minutes fire resistance. Each individual apartment must be capable of being its own compartment, this is achieved by means of compartment walls, floors and ceiling. The reason for this is so that in the event of a fire, the fire will be contained until the fire service arrive. The common area within each apartment block is another compartment. The stairway enclosure must be a protected stairway enclosure. This is normally achieved by solid block walls enclosing the stairway with a concrete ceiling overhead. Within the attic area there should be a wall separating each attic space over the top floor apartment. This wall must also be a compartment wall taken up to meet the underneath of the roof covering. In this type of wall there must be what is known as a fire curtain installed up the wall and across the underneath of the roof for 1.5meters. In some cases there will be a different type of system used, this wall will penetrate the roof which you will see from the outside. These compartment walls are designed to prevent fire passing from one apartment block to another. Over the last few months I have been working on an apartment complex, there was a fire in one of the blocks which resulted in fatalities. Some of the concerned owners contacted me and asked if I would meet with them to discuss their options. We met at the complex and went into the worst block which was closed down due to the severity of the damage that was caused by the fire. I had an initial walk through to access the damage and to decide what was required to re-open this block. This block remained closed for almost twelve months costing the owners in lost rent. The owners were not aware that the building did not comply with the fire safety certificate that was issued when they purchased their apartment. The owners and the management company did not want a re-occurrence of the previous incident so they retained my services to bring the entire complex up to standard. This incident resulted in fatalities, injuries, and property damage. You can read more about the issues that we discovered and the method that we used to bring the complex up to standard. Does the apartment or apartment block comply with the original fire safety certificate? A fire safety certificate has been put in place for the safety of the occupants of a building. There are some very easy ways of checking to see if it does comply. • Is there a fire alarm system that has been serviced and certified by a competent person. When you look at the control panel of the fire alarm system it is self-explanatory and easy to follow. Take your time and read the information that is available. Most competent installers will attach to the wall easy to follow instructions and a contact number in the case of an emergency. • Is the common area protected by the fire alarm system, the common area is something that a lot of tenants are not familiar with. The common area will include the stairway enclosure, the lobby area between apartments and the attic area. Each of these areas will require detection, if you can get access to the attic area have a look to see if there is a smoke detector present. This will also be indicated on the control panel. • The main fire alarm system will also be connected to each apartment, this will be done by the installation of a detector and sounder located just inside the apartment door. • Each apartment will also require a standalone detection system. The areas that require smoke detectors are, bedrooms, hallway and living room, the Kitchen will require a heat detector, thesedetectors must be interconnected with a mains feed and a battery backup. If you have concerns about the fire alarm system or the lack of an alarm system contact the management company and express your concerns. Over the next few weeks we will discuss other issues that you will need to look out for in your apartment block. Some of the concerned owners contacted me and asked if I would meet with them to discuss their options. We met at the complex and went into the worst block which was closed down due to the severity of the damage that was caused by the fire. I had an initial walk through to access the damage and to decide what was required to re-open this block. This block remained closed for almost twelve months costing the owners in lost rent. The owners were not aware that the building did not comply with the Fire Safety Certificate certificate that was issued when they purchased their apartment. The owners and the management company did not want a re-occurrence of the previous incident so they retained my services to bring the entire complex up to standard. This incident resulted in fatalities, injuries, and property damage. You can read more about the issues that we discovered and the method that we used to bring the complex up to standard. Does the apartment or apartment block comply with the original Fire Safety Certificate certificate? A Fire Safety Certificate certificate has been put in place for the safety of the occupants of a building.